Paintball is a fun sport and hobby, but speedball can rack up the excitement by a few degrees. Even if you are just starting in this game, careful gear selection can make you an unstoppable force on the field. Specifically, you will want to choose a paintball gun or marker that perfectly suits you. What type of paintball gun should you buy? First, make sure to perform due diligence on any gun you are considering for purchase. Research major criteria like use, quality, and cost. Look over reviews and visit sites that handle paintball guns before choosing one. It may be prudent to rent paintball guns for recreation before settling on a purchase. There are three major classes of paintball guns. Pump markers have their niche, but not in speedball. They are highly accurate yet require more strategy and time than what is suitable for most speedball venues. Why are mechanical paintball guns so popular? Mechanical markers are excellent for beginners because they have a simple design and are easy to use. They are well known for low maintenance and high durability. You can use them in inclement weather and muddy conditions without much concern for their upkeep. When only the best will do, use an electronic paintball gun. 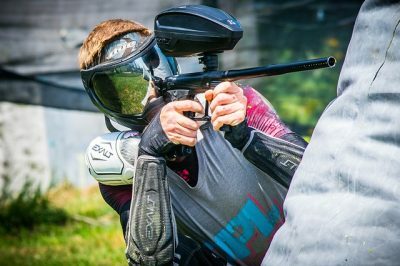 You will see players use mechanical markers in speedball, but even as a beginner you may want to invest in an electronic paintball gun to be on par with other competitors. Electronic markers can be fired much quicker than the other guns. An electro-pneumatic marker utilizes a circuit board to electronically control the shooting mechanism. 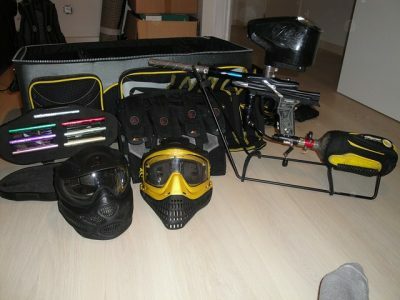 Otherwise, its composition is similar to other paintball guns with a small bolt triggering system and compressed gases. This electronic feature allows the shooter to fire automatic bursts. Electronic guns don’t require much force to pull the triggers, but they do require more skill to shoot effectively than do mechanical paintball guns. When correctly shot, electronic guns are among the most accurate paintball guns on the market. Electronic paintball guns also require more care and maintenance than do the other two classes of markers. They have more adjustable and moving parts that periodically need to be repaired. Their complexity and components make them less capable of withstanding the rigors of weather or improper use than their mechanical counterparts. Electro-mechanical paintball gun hybrids offer advantages of both mechanical and electronic markers. They are simple and sturdy and yet they still have an automatic shooting feature. These guns require little pressure to pull the triggers, like electronic markers. Parts are easily replaced and electro-mechanical guns are less expensive than electronic weapons. Before you rush and buy a hybrid as your dream partner in speedball glory, here are a few features to take into consideration. Electro-mechanical paintball guns are as noisy as mechanical paintball guns, and they require almost as much air pressure. Moreover, you will lose out on both accuracy and consistency. How much does a good speedball gun cost? By now you have decided the only way to respectably compete with your peers is to invest in your own gear. A paintball gun is a large portion of this expense. Even with speedball, you need to determine if your time investment will be regular or only on special occasions. This will guide you on how large of an investment you might make. Beginner-level guns are excellent for beginners, as the name would suggest, but also suit recreational players. If you are a part-time or recreational speedball player, $170 is a reasonable price for a good low-level gun. Mid-range markers will run from $300 to $500, and you can expect to spend from $500 to $1600 on high-end paintball guns. You may purchase a mid-range marker if your goal is to participate in occasional speedball tournaments. You will want a high-end marker if you are a die-hard speedball fanatic of course. These are equipped with features like eyes, regulators and programmable circuit boards to ensure optimal timing of shots. If you are new to the fun and exciting world of speedball, investing in a suitable paintball gun should be the smoothest part of your journey. Electric Smokers Are Easy To Use, But Do They Stack Up To The Alternatives?